The Library contains over 130 teaching techniques arranged into several Collections, each with a specific focus. Within each Collection are a number of Sets – or subcategories – which contain the HOW2s themselves. If you know roughly what you’re looking for then the search tool is a good place to start. It will find any Sets and Collections whose name matches your search term, including those that you have created or that colleagues have shared with you. To help you locate the HOW2s that best fit your needs you can browse the Standard Collections. Each of the Standard Collections is focussed on a theme, such as Literacy. The Teaching Strategies Collection contains all of the HOW2s and is generally the best place to get started. The Custom Collections are where your personal library is stored. 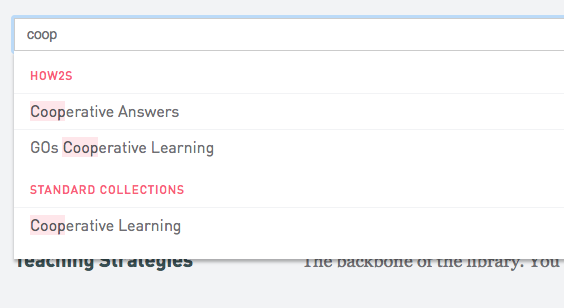 In ‘My Sets’ you can create, manage and share your own groups of HOW2s and in Shared Sets you can view the HOW2s that colleagues have shared with you. Finally, in your community’s Sets you can view the Sets that your administrators have created and shared with your whole organisation. This area is, in effect, your school or college’s personalised library. Within each Collection are a number of Sets. In the Standard Collections these are effectively subcategories, but within Custom Collections each Set has a specific purpose.